The first bowel movement a baby has is called meconium. Meconium is composed of amniotic fluid, mucus, lanugo (the fine hair that covers the baby's body), bile, and cells that have been shed from the skin and the intestinal tract. 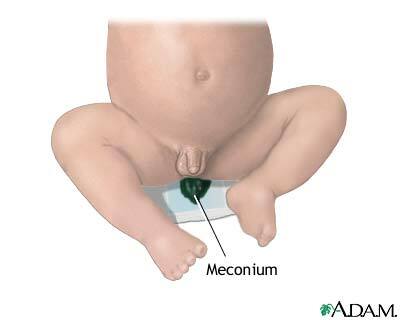 Meconium is thick, greenish black, and sticky.